How did the Left gain control of the discussion and definition of “Civil Rights?” They did it because those in leadership on the Right have been either too cowardly to advance a biblical, constitutional and conservative definition or they agree with the Left. Either way the discussion has been placed squarely in the hands of the MSM, the liberal Democrats, and various activist to the detriment of our societal evolution and constitutional government. I agree with Mark Levin that I it is disgusting to have the likes of Al Sharpton, Jesse Jackson, Luis Farrakhan, LBGT, NAACP, Media Matters, Planned Parenthood, etc. tell us what a civil right is. My blood boils when I hear people like the sitting president tell the world that “Climate Change” , “Amnesty” or “Income Equality” is a civil right. Everything that the liberal left advances camouflages their agenda as a “civil right” packaging and selling it to their followers who heartily echo AMEN! Civil Rights properly understood is about liberty, faith, family, freedom, national sovereignty and a constitutional republic. 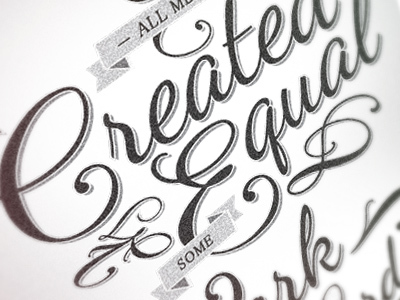 In simple terms, it is about “Life, Liberty and the Pursuit of Happiness.” A civil right is a right in which everyone receives ‘equal’ treatment without discrimination. There is a confusion of ‘civil rights’ and ‘civil liberties’ and most of the left incorporate both as Civil Rights. The sad thing that in today’s politically correct world if one is a homosexual the charge is their civil rights are violated if any person or business does not accommodate their preferences. Their civil right trumps the constitutional right (civil right and liberty) under the 1st Amendment’s guarantee of Religious Liberty and Freedom. The government’s mandate that a business, service a person in an act that violates their conscience and usurps their religious convictions. If a homosexual has a ‘civil right’ to practice their lifestyle, marry, etc. why is it not a ‘civil right’ for another to practice their faith and beliefs without interference from the government? 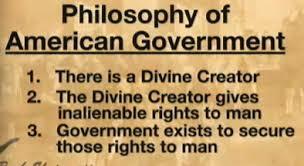 Civil Rights or Unalienable Rights should be understood as rights fixed by the Creator rather than the government. That makes them permanent not at the disposal or whim of elected officials. They are absolute rights which we have been ‘endowed’ meaning they are cannot be separated from us and are part of our humanity. Simply, the government did not grant them only recognized them and therefore has no right to diminish, rescind or suppress them. The Bill of Rights issued a guarantee to protect every citizen’s God-given unalienable right to Freedom of Speech, Religion, Press, Conscience and Self-Defense to name a few. If a right us unalienable or inalienable it is “incapable of being alienated, sold or transferred.” Those rights are not capable of being surrendered or transferred without the consent of the one possessing the right. The government can “secure” not “grant” or “create” those rights. In the guarantee that we can “Pursue Happiness” is implication of the right to pursue the vocation of our choice, lawful business in a manner consistent with the equal rights of others not subservient to them but equal to them. We have allowed the discussion of “civil rights” to become a leftist weapon for the advancement of a socialist, Marxist, liberal ideology and the very claim of a violation in that arena sends politicians into the shadows looking for cover. I will defend your “civil rights” and “civil liberties” but will never consent to having mine tossed on the trash heap to accommodate what you perceive as yours. I support everyone being treated equal but not that you have a “civil right” to redistribute that which another has worked for and earned distributing to others in the name of equality or civil rights. If you adopt a lifestyle that is contrary to my beliefs I will defend your right to pursue it but never consent to forcing others to accommodate or facilitate it. If you believe it is okay to abort a baby that is between you and God it is your right to believe what you believe but I will not consent to spending taxpayer dollars to fund the process and my beliefs find it reprehensible and even murderous. I cannot agree that it is the right of a woman to make the decision when there is no representation for the child, yet unborn. Leftist will vehemently disagree for they do not believe that a fetus is a living human being until birth and even then some stretch the definition of life to allow the murder of a baby born alive. Civil Rights? I am totally supportive of the “civil rights” of all people but totally opposed to the politicized definitions and activism of today. I agree with Mr. Levin that we need a New Civil Rights Movement that has not been coopted by the leftist and politicized to the point it is virtually non-existent and meaningless. God help us return to the constitutional definitions and pursue the constitutional republic our founding fathers sought to establish. God bless you and God bless America! 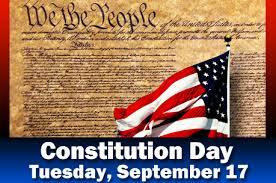 Constitution Day was Thursday, September 17, 2015 and we celebrated the anniversary on which 39 brave souls signed the United States Constitution. History, for the most part, credits James Madison with being the father of the constitution and Thomas Jefferson as the architect of the Declaration of Independence but they were just two pieces in the puzzle. How many know that Gouverneur Morris of Pennsylvania almost single handedly meshed together the final wording of the constitution? We hear little about him and most know little other than his unusual name. There are others and one in particular that is worthy of note is Roger Sherman the delegate from Connecticut. Without Robert Morris and Roger Sherman one could legitimately ask if the United States Constitution or America would even exist today. It would not be the America the founding fathers gave us or the America we enjoyed for over 200 years. Sherman was one of, if not the, prime engineer of the Connecticut Compromise which guaranteed the small states would have an equal vote in the United States Senate. Interestingly that is the only part of the constitution that cannot be changed. 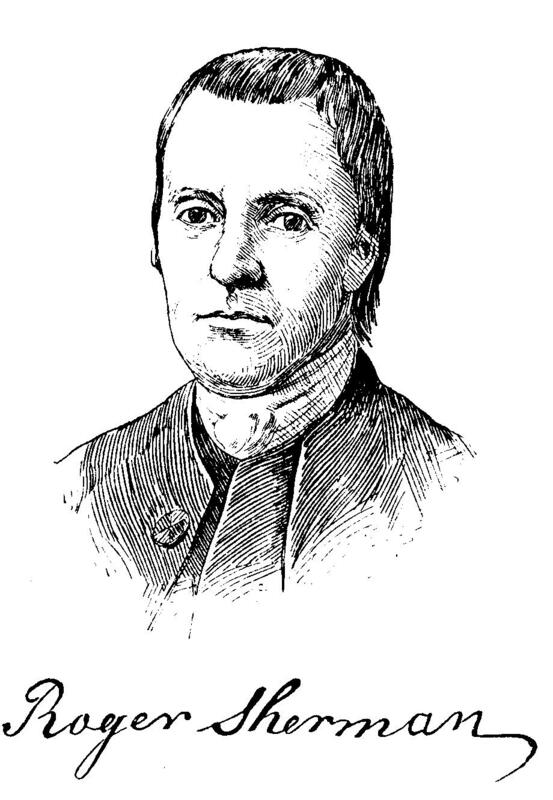 Roger Sherman was born April 19, 1721 and died July 23, 1793. 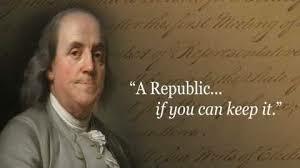 He was one of the early and foremost politicians and lawyers in the new Republic. He was a member of the Committee of Five charged with drafting the Declaration of Independence. He grew up in Stoughton, Massachusetts and received his education in his father’s library without formal education. He was admitted to the Litchfield bar in 1754 and became Justice of the Peace. He was treasurer of Yale University and received an honorary Masters in Arts degree. He was elected to the Continental Congress in 1774 and in 1787 he offered a solution to the amendment of the Articles of Confederation. The solution was known as the Great Compromise and laid out the plan for the people to be represented in the House of Representatives by proportion. The state would have one representative for each 30,000 people and each state would have two Senators. William Evarts. Sherman’s grandson was arguably one of the most influential lawyers in the 19th century and a key founder of the Republican Party. If you recall from history he was the lawyer who defended President Andrew Johnson during the impeachment trial. He was Attorney General under Ulysses S. Grant from July 1868-July 1869. His skills as an attorney probably led to the controversial election of Rutherford B. Hayes. Ebenezer Rockwood Hoar. Evarts’ first cousin succeeded him as Grant’s Attorney General for 1869-1870. Hoar’s brother George Frisbie Hoar served as Congressman and Senator from Massachusetts and made his mark in both houses. Roger Sherman Baldwin. Another grandson served in Connecticut politics and was governor of the state from 1844-1846 and then in the Senate from 1847-1851. Edward Baldwin Whitney. Sherman’s great grandson was Attorney General under Grover Cleveland in 1895. Others served as lawyers for the railroads, solicitor general and presidents of the New York Bar Association. Archibald Cox, great great grandson of Sherman was President John F. Kennedy’s solicitor general and in May of 1973 he was appointed as Watergate Special Prosecutor. We have seen the Sherman descendants involved in America politics for generations. When so many have given so much to carve out the America our founders and the colonist so valiantly fought for how dare we allow any interloper to usurp that great document. I do not care if they are Democrat, Republican or Independent the Constitution is the Constitution and must be preserved and followed. It, not the President, Congress or the Supreme Court is that which is to guide our nation. If we fail to elect an individual who is committed to the Constitution of these United States in the 2016 Presidential Election we are signing the death warrant of the American Republic. The number one thing I want to know from the candidates is their view of the Constitution. God help us do that which is necessary to restore America to its rightful status as a Constitutional Republic. God bless you and God bless America! That is simple but complex for both Congress and the Courts have abdicated their jurisdiction and responsibility so frequently and the President usurped their powers to the point that we have in many respects our system has been virtually dismantled. Even when the SCOTUS rules against this administration, this president has chosen to ignore them for the most part and has frequently thumbed his nose at Congress badgering, bullying and manipulating them so they are impotent figureheads more than legislators. The founding fathers were deliberate and clear in their desire to prevent any branch of government from being too powerful. 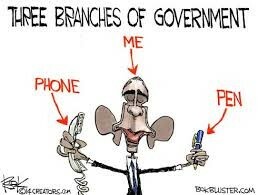 The three branches devised by the Constitution are: The Legislative (House of Representatives & Senate). The Senators were originally appointed by State Legislatures but have since become elected by statewide popular vote. The Executive (President, Vice President, & Departments under their authority and oversight). The Judicial (SCOTUS and federal courts). Each has enumerated powers, responsibilities and limitations and each branch was designed to provide a check and balance to the others. The Executive: Was given veto power over all bills; appointment of judges; can make treaties; ensure laws are carried out; commander in chief of the military and has the power of pardon. The Legislative: Was given power to pass all legislation; establish all lower federal courts; override a presidential veto; impeach a president. The Judicial: Was given the power to try federal cases and interpret the laws of the nation in those cases; the power to declare any law or executive act unconstitutional. These all have specific guidelines and those lines have be so blurred through the years they hardly exist and each branch tramples on the authority of the other but none more so than the Executive under this current administration. Separation of Powers was not a totally new concept devised by our founding fathers but has existed at least as far as ancient Greece. Aristotle called for a mixed government made up of the monarchy, aristocracy and democracy for he felt that none were ideal in and of themselves. John Locke presented his idea in his 1690 “Civil Government” treatise and separated powers between executive and legislative. Charles-Louis de Secondat, Baron de La Brede et de Montesquieu or Montesquieu expanded on Locke’s formula and included a judiciary to the mix. The framers took all those ideas and melted them into what became the American Constitution with a few twists and tweaks. 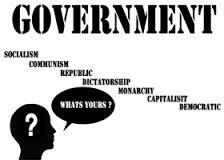 If we look at some of the examples of other national governments and their separation of powers we view the British and their Parliamentary system where there are two houses of the legislature (House of Lords and House of Commons). Although, this is possibly changing with regard to the House of Lords it basically affords the House of Lords the judicial responsibility where they are the final appeal but have almost no authority legislatively. The House of Lords can delay legislation but cannot veto it. The House of Commons or Members of Parliament are elected representatives of the various districts. The majority party makes all the laws and the minority frequently has little voice. The Prime Minister the nearest to the American President is a Member of Parliament chosen by the majority. The judiciary has no power to review legislation as does the U.S. Supreme Court. The French example reveals the President is elected for a five year term and can dissolve Parliament and call for new elections. He appoints the Prime Minister. The President and PM head the executive branch. The President does not have veto power over legislation but can ask Parliament to reconsider. There are two houses of Parliament and a Constitutional Council made up of nine members but with only a fraction of the SCOTUS. The Canadian example is very similar to the British system and until 1982 Canada did not have power over its own constitution. The judiciary is far more powerful in Canada than Britain or France and their judiciary has nine members that serve for life or until age 75. Then we turn south to Mexico and it is so convoluted that I dare not go into it. There are numerous similarities and significant differences in each. I read a discussion asking the question, “Is the United States system superior?” The conclusion was depending on who you ask. The article suggested that the French and British would scoff at the American head of state would have no power to make laws but would shudder to think of judges determining that the expressed will of the people is null and void calling it unconstitutional. The Canadians would probably feel that all state powers should be fully detailed and enumerated and the Mexicans would likely be surprised at the longevity of American politicians. Americans, on the other hand, are often amused by a monarchy and its figurehead control and even theoretical hold on Canada. Americans express concern over the French Presidency having tyrannical emergency powers. That being said, our framers designed a system in which the three branches of government were to provide legitimate checks and balances thus preserving the constitution and Republic with the ultimate power being WE THE PEOPLE. Today, none of the three consider WE THE PEOPLE of any particular consequence and treat us as pawns rather than overseers. Thus, a reason for WE THE PEOPLE to be resurrected in our involvement and reclaim our constitutional authority as owners of the federal government. 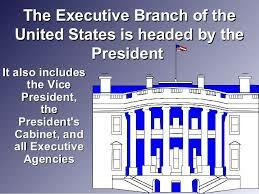 If we do not virtually or literally clean house in Washington this can never become a reality. I’ve seen some posts from liberals declaring that Republicans are living in a reality of their own creation. Some of them cite a number of the policies of this administration they consider good including the Iran nuke deal and Obamacare. 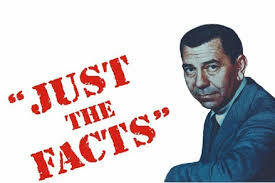 I find the assertion that Republicans and/or conservatives are living in fantasy land to be ludicrous for it has been those very people who have exposed the deception and truth about many of the policies of this administration and the agenda of the leftist. The declaration that the Planned Parenthood videos are fake – Democrat. The false declaration that 99% of the World agrees with Obama on the Iran Nuke Deal – Democrat. Global Warming or Climate Change is the single most threatening thing our world faces today – Democrat. ISIS is not Islamic – Democrat. Obamacare has reduced the cost of healthcare and health insurance and if you like your plan and doctor you can keep your plan and/or doctor – Democrat. The economy is roaring back – Democrat. The borders are secure and illegal immigration is not a threat to national security – Democrat. This administration is the most transparent of any in our American history – Democrat. The 2nd Amendment does not cover the rights of citizens to keep and bear arms – Democrat. Who booed when a politician said All Lives Matter? – Democrats. Republicans, Conservatives, Tea Party, etc. are Domestic Terrorist – Democrats. That is the tip of the iceberg and there are pages more that could be listed, so I ask “Who is living in a fantasy world of realities of their own creation?” I laugh when I read many things written about any conservative from what could only be identified as transference or delusion. But, alas there are those who drink the Kool-Aid and spin the spin to support their ideological views. 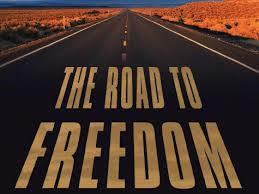 My faith and love of freedom prevent me from ascribing to the views of the left. You may be, as a college professor I had years ago when he and I were debating evolution vs. creation, “Evolution and my religion do not conflict.” I informed him that mine did but the point is that you may find that the views of the progressive, socialist, leftist, statist and your religion do not conflict and if so that will have to remain between you and God. I want the best good for everyone and desire deeply that our Constitution be honored, respected and followed. I long for a time when the court will not legislate, the President will not act as sole authority in the land and respect the Three Branch System of our Government and a time when Congress will do their jobs constitutionally. Regardless of which side of the aisle or issue you stand rejecting reality is not productive or beneficial. Are there things the Democrats support that are good? I’m sure there are. Are there things the Republicans support that are bad? I’m sure there are. I disagree with the GOP on a number of issues and am willing to support a Democrat proposal that is constitutional and in the interest of America not political position or agenda. My commitment is to my faith, family and freedom and frankly do not care which party takes actions consistent with that view. I have grown to detest labels in all facets of life if for no other reason, they tend to build walls and end open honest discussion. That being said, I find no Democrat candidate for President that I could support. Life has been described as a series of hard choices and difficult decisions and that is accurate, to a degree. If everyone accepted their personal responsibility, their positions and assignments in life many of the hard choices and difficult decisions of others would not be significantly lessened. What we do affects others overtly, covertly, directly and indirectly. None of us are an island and what we do affects others directly and/or indirectly making it imperative that we take full responsibility for our own actions and attitudes. If parents neglect their responsibility as parents failing to make the hard choices and difficult decisions that come with good parenting, they significantly diminish the prospects of their offspring becoming responsible citizens and parents. I am not saying that a bad parent cannot have good children who become good citizens and parents but I am saying the road to that objective becomes more difficult. If we, as parents, fail to discipline our children we teach them that restraints are bad and it is acceptable to be a law unto themselves. If we, as parents, fail to make the hard choices and difficult decisions giving our children free rein to do or have whatever they desire we teach them an attitude of entitlement and lack of respect for life, value, productivity and others. Parenting is filled with hard choices and difficult decisions but we brought that child into this world and are responsible for their nurturing and preparing them for life. 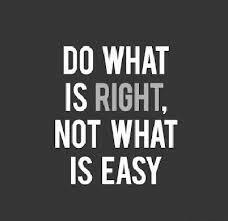 Our choices and decisions may not be popular but necessary and if we are to fulfill our duty we must be willing and capable of making the hard choices and difficult decisions. If as employers and managers we neglect our responsibility to make the hard choices and difficult decisions we destroy productivity and create a work environment that is conditioned to become incredibly hostile. Many decisions in business cannot be subjected to the democratic process or made solely based on emotion. I have faced times when I had to make the decision to reduce staff and had to evaluate the entire objective and each individual. In a couple of those times I had to release a person that doing so broke my heart because of the personal connection I felt and knowledge of their need. 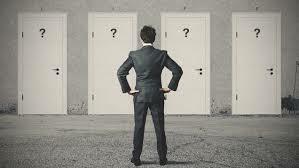 Yet, the hard choice and difficult decision, in the interest of the overall objective had to be made. 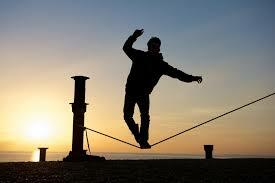 My decisions, though often difficult, were a part of the package of being an employer or leader. I had a responsibility that went far beyond one person or one family. There were things I could do and did to help those adversely affected by my hard choice and difficult decision but those had to be made. 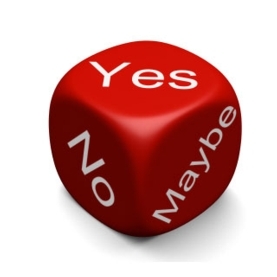 In government and politics those elected to office should know that accompanying their position is the requirement and responsibility to make hard choices and difficult decisions. When politicians are unwilling to make the hard choices and difficult decisions for fear of losing votes, campaign contributions or network connections for life after politics the entire country suffers. If a politician makes choices based on convenience or popularity they are doing a disservice to those who elected them. 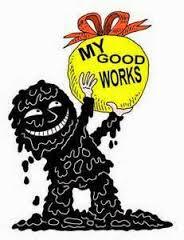 If a President or any politician is more concerned about perception and their legacy than achieving the best good for the country they are moral failures although possibly political successes. Our founding fathers and the colonist had to make hard choices and difficult decisions as 1776 dawned. Their decisions were not always the most popular nor the road of least resistance but if there was to be a Free and Independent Sovereign Nation known as the United States of America they had to stand firm, bite the bullet and pull the trigger and they did. They had to make the incredibly difficult choice between personal security and safety and placing everything on the line in what would have been viewed an almost impossible dream. They had to make the difficult decision to sign their names to the Declaration of Independence knowing that made them marked men and placed their possessions and families in jeopardy should they fail. They demonstrated a requisite in leadership and made the hard choices and difficult decisions that birthed the United States of America. Today, we have politicians who are either incapable or unwilling to do so. Too many make promises to win elections then are quickly assimilated into the DC network and refuse to make the hard choices and difficult decisions America needs and requires to reclaim her former greatness. That brings us to the bottom line – You and Me. It is incumbent upon us to be willing to make the hard choices and difficult decisions regarding the direction of our nation. Are we willing to take the path of least resistance, sing que sera sera and sit around the proverbial campfire singing kumbaya while our heads are buried in the sand or somewhere? Life is truly a series of hard choices and difficult decisions and if we are to be responsible adults, citizens and patriots we must accept that reality and do that which we know to do. As a Christian my confidence and trust is in God not government and I will continue to pray for my nation and her leaders while I follow the directive of Ecclesiastes 9:10 and do what I find to do with all my might. I am 100% committed to the Restoration of our Constitutional Republic.